Readers and writers alike gathered at the 6th annual Chicago Book Expo last Sunday. Last Sunday, writers, editors, nonprofits, and small presses in the Chicago area came together to promote independent writing and publishing at the Chicago Book Expo. Now in its sixth year, the all-day event took place at Columbia College Chicago. The now-defunct Chicago Writers House began the Expo in 2011, but it was not until volunteers Lynn Haller and John K. Wilson combined efforts two years later that the expo truly took off. As writers and editors themselves, they recognized the importance of having a free platform where independent presses and other independent literary groups could share their work. When this niche was on its way to leaving Chicago, Haller and Wilson stepped up to keep the Expo alive. Over the past six years, the pair has grown the Expo with great success, bringing in a constant stream of attendees as well as sponsors such as the South Side Weekly, Chicagoly magazine, CHIRP Radio, the Northwestern University School of Professional Studies, and the Poetry Foundation. Together, this year’s volunteers and sponsors put together an event to celebrate the work of over 80 exhibitors and nearly 50 speakers. Among the Expo’s keynote speakers were two from the University of Chicago, Eve Ewing and Adrienne Brown. Brown spoke about her new book The Black Skyscraper, which examines how architecture influences perceptions of race. Ewing gave an emotional and highly performative recital of poems from her anthology Electric Arches, bringing alive the themes of black womanhood in her poems. She then discussed the events and individuals that guide her poetry, explaining how everyday objects—from notebooks to moisturizer—inspire her. 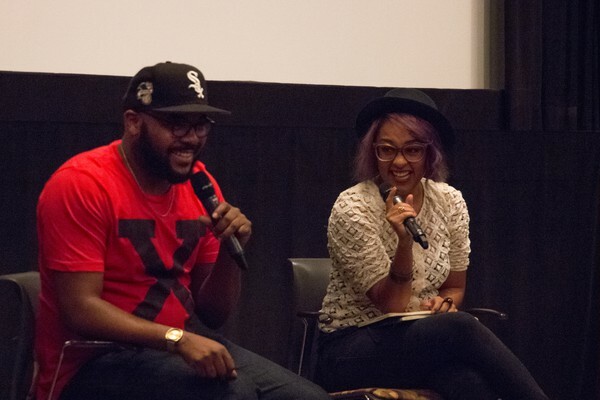 Nate Marshall (left) and Eve Ewing (right) in conversation at the Chicago Book Expo. 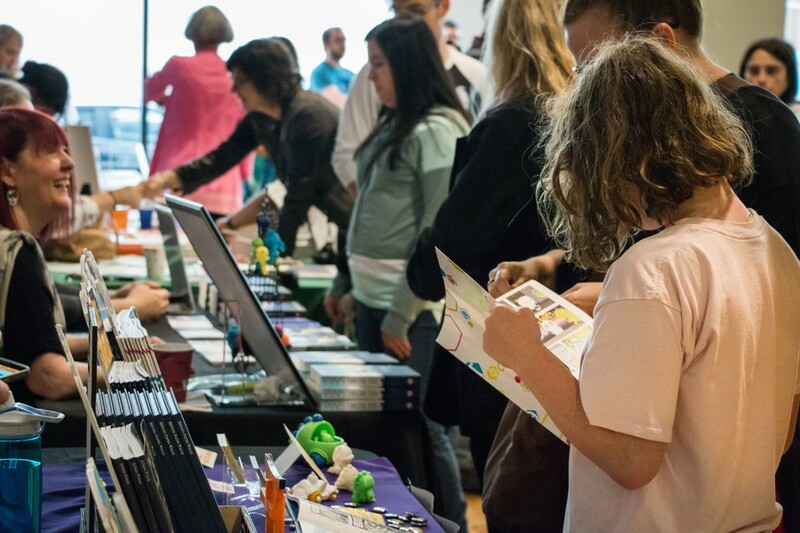 Apart from attending talks, Expo attendees also chatted with exhibitors, which included small presses, literary radio shows, zine publishers, and nonprofits that promote literacy in Chicago. Two University of Chicago based journals, Euphony and Chicago Review, were also among the exhibitors at the Expo. Euphony accepts poetry and prose submissions from around the world and compiles them into a biannual journal; Chicago Review has been publishing prose, poetry, and literary criticism since 1946. By coming together at an event like the Expo, these publishers—regardless of their size or scope—attracted more attention to the whole industry than any one of them could alone. “Direct-to-customer sales are the lifeline of a small press,” explained a representative from Belt, a small press based in Cleveland that publishes nonfiction anthologies. For such small presses, the Book Expo provides a valuable opportunity for publishers to interact with customers in person. Another publisher at the Expo was Haymarket Books, an independent publisher that focuses on leftist writing and aims to give writers an editing and publishing experience that is more personalized than what they might experience with larger, more corporate publishing companies. 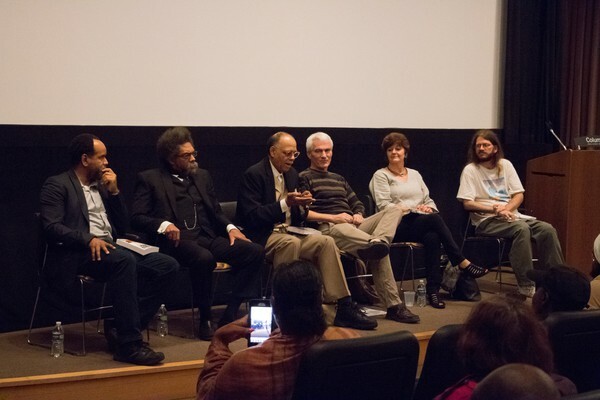 Writers give a panel discussion entitled "Race and Class in Trump's America" in the Film Row Auditorium of Columbia College Chicago. Aside from publicizing their work, exhibitors also came to the event to meet contemporaries in their field. But they still recognize themselves as a community of collaborators instead of competitors; each has its own role in the independent publishing world. Similarly, literary nonprofits come to the Expo to reach out to people who might be interested in collaborating with them on projects. For instance, Chicago Books to Women in Prison hopes to attract people who have an interest in gender issues or criminal justice reform. “[People] will either want to come volunteer with us or...have some books later on at home that they’ll drop off for us,” the representative explained. A yearly gathering of book lovers, the Expo shows just how integral independent publishing is to writers hoping to spread their ideas, distribute their work, and connect with like-minded members of the literary community. In a city overflowing with people who appreciate the crucial role writing plays in their lives as writers, editors, publishers, or readers, the Chicago Book Expo celebrates a vibrant literary scene.